However, looking at Kurigami's portraits again, I began to think that, although they are most certainly "orthodox" works, they also have a unique texture, a working of consciousness that is not often seen. 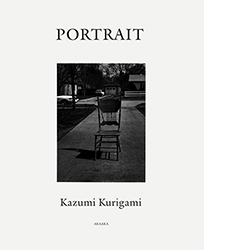 One may not realize this just by looking at one or two of his photographs, but when you look at a large number of them, you begin to discover a kind of singularity in Kurigami's portraits that allows you to state "these are unquestionably portraits done by Kuragami Kazumi." It is this idea that we will now reexplore. ―――――Kotaro Iizawa "Pictures of 'unordinary people' - The portraits of Kazumi Kurigami"
Among his best know photo-collections are Oyogu hito, Hi to Hone, Crush, Northern, Diary 1970-2005, and Hi to Hone II. Recent solo exhibitions: "Diary" (Leica Salon, 2009), "Hi to Hone II" (Taka Ishii Gallery, 2011), "a trip in death at my house" (Impossible Project Space, 2012), "Portrait of a moment" (Tokyo Metropolitan Museum of Photography), and "Nobuyoshi Araki and Kazumi Kurigami: A Mirror of Utsusemi, Ship of Time - Self/Dear/Shadow" (Nara Prefecture Complex of Man'yo Culture, 2013). He directed the 2008 film Gelatin-Silver.